CONCORD, N.H. -- The New Hampshire Republican Party headquarters was spray painted with the word "Nazis" Wednesday night. 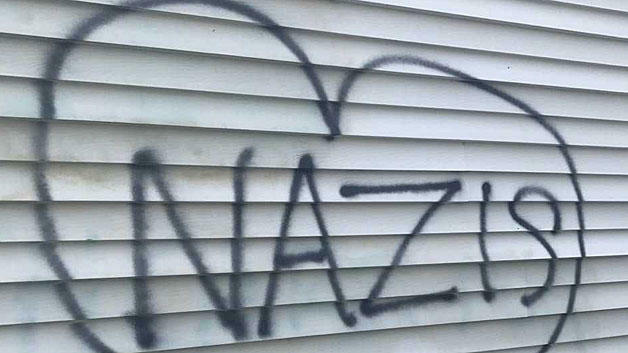 Concord Police found the vandalism Thursday morning. Police say the vandals also threw rocks through several of the windows and other graffiti had been spray painted on the outside of the building. The Concord police confirmed it was investigating the incident, adding "the symbolism contained within this act of vandalism is of particular concern to law enforcement and is considered intolerable within our community." This isn't the first time the headquarters has been vandalized, he said. Someone threw rotten food at its front door in 2014 and, before that, wrote "Health Care For All" near the spot of the latest incident. "It's malcontents who obviously don't represent the majority of the public in New Hampshire," said Hynes, noting a recent Granite State Poll found 62 percent of residents support Republican Gov. Chris Sununu. "They are fringe elements." The chairman of the New Hampshire Democratic Party, Ray Buckley, called the vandalism "unacceptable" and said the party "wholly condemns this criminal action and hopes the perpetrator is held accountable." "There is no place for that in our politics," he added. Members of the state's all-Democratic congressional delegation also spoke out against the vandalism. Sen. Jeanne Shaheen tweeted that the vandalism was "shameful" and "we all need to stand together in the face of hate & bigotry." Sen. Maggie Hassan tweeted that the vandalism was disgusting and the "perpetrator must be held accountable." U.S. Rep. Carol Shea-Porter said she hopes "the person or people who committed this vandalism will be apprehended quickly," adding "anyone anywhere who fans the flames of hate must be held accountable." The incident comes several days after a demonstration by white supremacists and neo-Nazis in Charlottesville, Virginia, over the removal of a Robert E. Lee statue. The demonstration turned violent and left a counterprotester dead. New Hampshire's top elected Republicans and Democrats have criticized the white supremacists as well as Republican President Trump's comments equating them with the counterprotesters.